Check out the live demo, and read about the updates below. The new editor is in preview mode, saving and buying cables is disabled. The editor is full screen and adjusts somewhat to different device sizes. 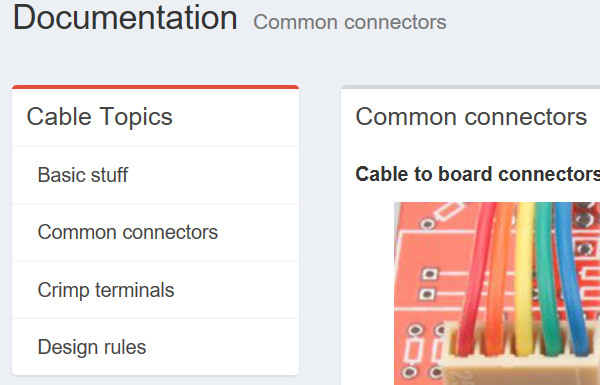 Click “Add Connector” or “Add Wire” to insert a new part. The add part dialog has been completely reworked. 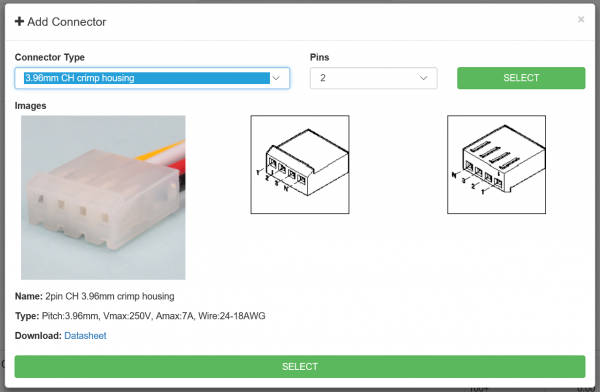 Choose the connector family to see a photo and isometric drawings with pin numbers. There’s room to add more information about the part in the future. Click and drag to connect a wire and a connector. This is different than the click-to-select interface in the previous editor, and lacks the UI bugs. Pins, labels, and connections are handled by an open source library called jsPlumb. Y-type one-to-many connections can be made for some parts. It’s also possible to do U-type connections that connect two pins of the same connector to the opposite ends of a single wire. Click to flip the connector and pin order. The reverse view shows the bottom side isometric drawing. Click the wire to edit the length. Click “X” to remove the wire and its connections. This is much more compact than the old editor and makes complicated cables look a lot cleaner. DirtyCables.com will be the new dedicated site for the Dirty Cables service. The new site has simple and clear navigation, and it gives us room to grow the cable documentation and resources. In the next year we hope to double the connector and wire options, and add 100 common pre-made cables to the store. Of course it would also be nice to have mating sockets for all the connectors. It’s a big decision to move this service outside DirtyPCBs, but we’ve made a lot of progress in the last year. We have a solid supply chain, we can accurately estimate prices, and we have a procedure to evaluate cable samples before they ship. DirtyCables is currently in preview mode, but it should be open for orders early next week. Try out the new cable editor preview here. Can’t wait to buy custom cables? DirtyPCBs’ cable creator is ready to take your order. Need to see the connectors? Try our cheap Dirty Connector Sample Kits. This entry was posted on Tuesday, October 2nd, 2018 at 10:34 am	and is filed under cables, DirtyCables.com. You can follow any responses to this entry through the RSS 2.0 feed. You can skip to the end and leave a response. Pinging is currently not allowed. Still no option to specify a tinned wire end – this can just be another connector type, along with cut end, maybe a couple of tinned lengths. When will the page go online? I would love to see more of the new service!